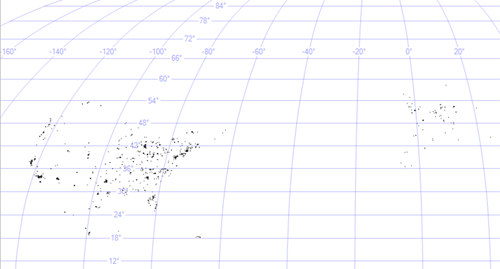 … and is accessible to anyone on the web. 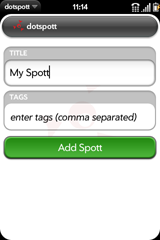 Note: All spotts are private by default; they can only be seen by you when you login or by someone with whom you’ve shared the spott info via email. Edit: I should mention this is a proof of concept of Unity. 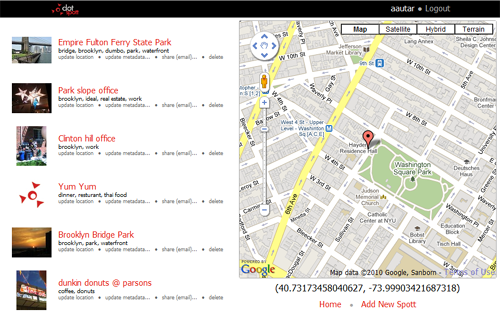 There are actually no async calls beyond those for Google Maps. Sticky note icons now appears when a note is attached to a spott. 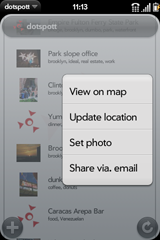 Clicking the icon will bring up a dialog with the note. Spott submenus are now made to look more like buttons and spaced a bit further down from the tag list. 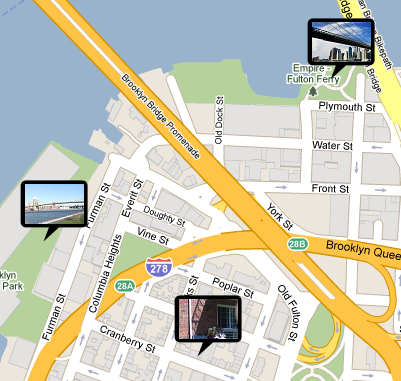 The dotspott web client has been updated yet again, this time I’ve added support for photo markers. 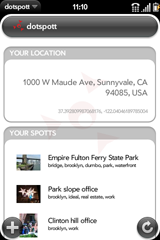 Local search is now available on the dotspott web client; allowing you to search for local venues and add them to your list of spotts. The Google Maps API v3, which is used by dotspott, doesn’t really allow for local search and the Local Search API itself is deprecated (however, as per Google’s deprecation policy, it should be available until Nov. 2013). 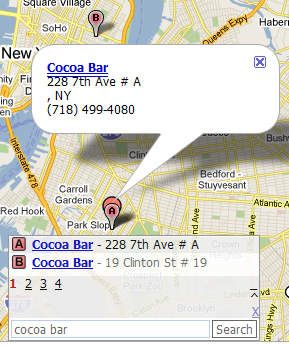 What I did was use gmaps-api-v3-googlebar, which allows adding a google-bar like control to the map. One interesting thing I needed to do that wasn’t directly possible with gmaps-api-v3-googlebar update a few other things after one of the search results were selected. I wanted to avoid touching the gmaps-api-v3-googlebar code, so I did this by getting a reference to the existing event handler, then overwriting it with a new function, which called the previous event handler function. Here’s an example where we grab the reference to the existing selectResult event handler (searchResultPre), overwrite with a new event handler, call the previous handler (binding to window.gbar, the instance of window.jeremy.jGoogleBar; binding is necessary b/c the event handler references this internally), then add some new functionality where we modify a paragraph element in the DOM (id = map_position) to show the position of the local marker that is selected. 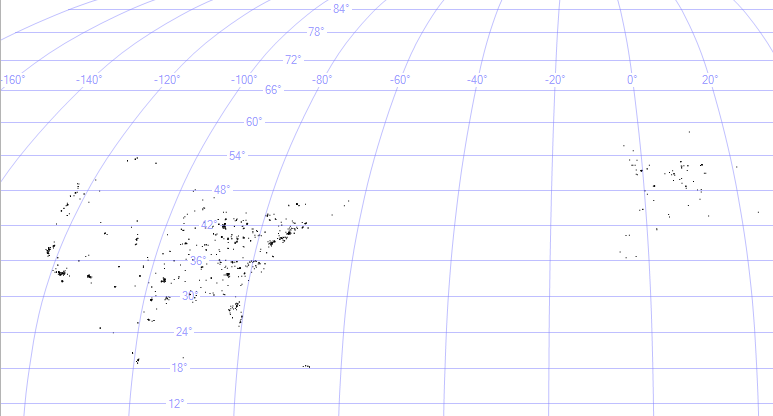 oh, and yes, this is using jQuery; $(‘#map_position’) should have given it away. 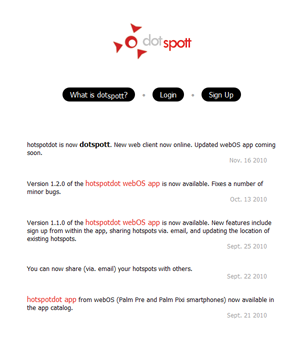 dotspott for webOS v1.3.0 should now be available in the webOS app catalog. 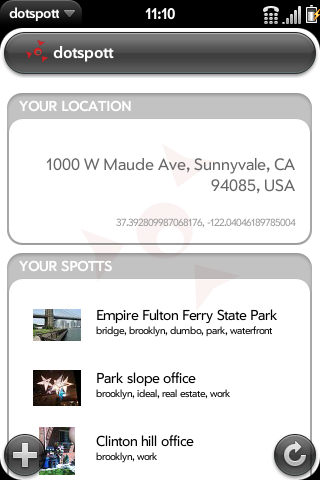 dotspott will show your current locations and, using the Google Map API, reverse geocode the latitude, longitude pair to tell you where you are. A smaller update (v1.3.1) should out in the coming week with some minor stylistic additions. 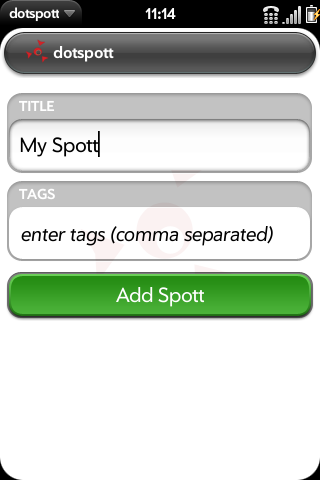 I’ve been working on a fairly major update to hotspotdot, both the web client and the webOS mobile app. First, a new name, accompanied by a new logo. 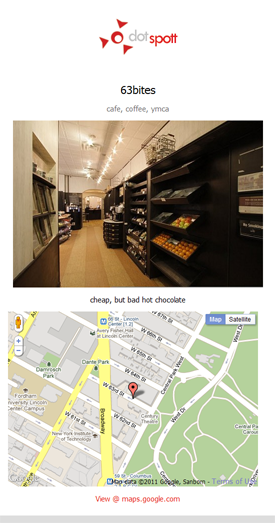 This should (hopefully) put an end to any confusion that the app has anything to do with wi-fi hotspots. It also allows for a much nicer URL as I was able to get dotspott.com (much more elegant compared to the previous, my.hotspotdot.net). There’s some minor style changes to the index page. Also, some additional code for some minor improves in user experience, such as auto-focus on input fields when a dialog comes up. 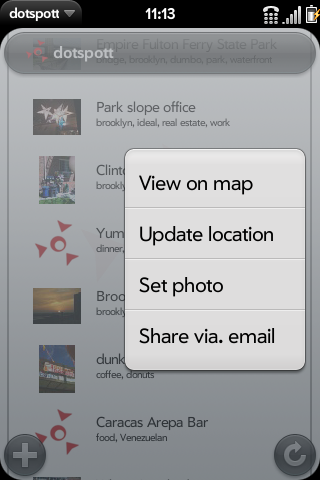 The updated webOS app is almost done. I’m just doing some last minute testing before I put it up in the app store, so I’ll have some info and screenshots up soon. Edit: h/t to Shifting Pixel for the cool Smart Image Resizer; I really wasn’t feeling up to writing image resizing and caching routines, and this little library was a perfect solution.